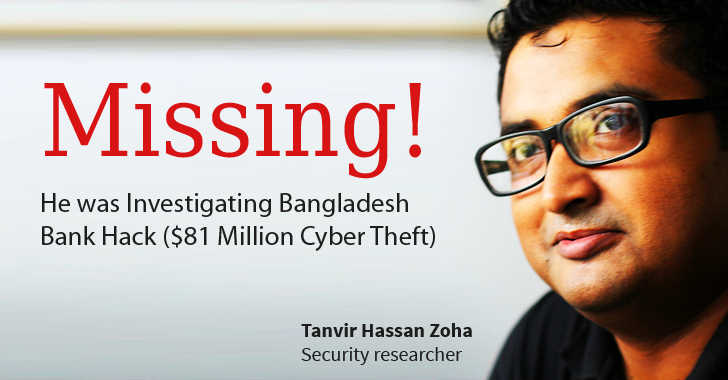 Tanvir Hassan Zoha, a 34-year-old security researcher, who spoke to media on the $81 Million Bangladesh Bank cyber theft, has gone missing since Wednesday night, just days after accusing Bangladesh's central bank officials of negligence. Zoha was investigating a recent cyber attack on Bangladesh's central bank that let hackers stole $81 Million from the banks' Federal Reserve bank account. Though the hackers tried to steal $1 Billion from the bank, a simple typo prevented the full heist. During his investigation, Zoha believed the Hackers, who are still unknown, had installed Malware on the bank's computer systems few weeks before the heist that allowed them to obtain credentials needed for payment transfers. With the help of those credentials, the unknown hackers transferred large sums from Bangladesh's United States account to fraudulent accounts based in the Philippines and Sri Lanka. However, at the same time, Zoha accused senior officials at Bangladesh central bank of gross negligence and weak security procedures that eventually facilitated the largest bank heist in the country. The Central bank's governor Atiur Rahman, along with two of his deputy governors, had to quit his job over the scandal, hugely embarrassing the government and raising alarm over the security of Bangladesh's foreign exchange reserves of over US$27 Billion. However, when the investigation was still going on, Zoha disappeared Wednesday night, while coming home with one of his friends, according to sources close to Zoha's family. While speaking to media in the wake of the massive cyber attack, Zoha identified himself as the ICT (Information and Communication Technology) Division's cyber security expert who had worked with various government agencies in the past. Soon after Zoha's disappearance, the government officials put out a statement but did not provide more details besides the fact that they opened an investigation. Zoha's family members suspect that the comments Zoha made about the carelessness of bank’s officials on the Bank heist to the press on March 11 are the cause of his disappearance.